We’ve seen the verbal and Twitter shots taken by Trump at the tech giants since he’s been in office. And the threats have slowly been materializing as policy. With this in mind, we’ve talked quite a bit about the domestic leveling of the playing field. The tech giants (Facebook, Amazon, Netflix, Google, Twitter …) are on the regulatory path to being held to a similar standard that their “old economy” competitors are held to. They may have to pay for real estate (i.e. bandwidth). They may be scrutinized more heavily for anti-competitive practices. And they may be liable for content on their site, regardless of who created it. The latter was the subject of the Trump tweet today. And he was asked about it in a press conference. He said we “have to do something about it.” He called the discrimination and bias “collusion” from the tech giants. The regulation is coming. And depending on the degree, at best, it changes the business models of these “disrupters.” At worse, it could destroy them. Imagine, Facebook and Twitter being held liable for things their customers are saying on their platforms. That’s endless compliance to ward of business killing liabilities. As compliance costs go UP for these companies. The cost goes UP for consumers. The model is changed. 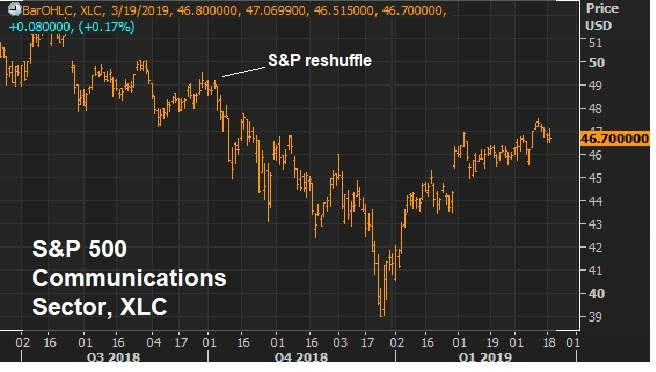 On a related note, remember, last September the S&P 500 reshuffled the big tech giants. Among the changes, they moved Facebook, Google and Twitter out of the tech sector and in to the telecom sector (re-named the “Communications” sector”).